Russian America Co. Magazin, by Gary Candeleria, 1984. The only Russian-era building remaining in Kodiak, Alaska, is the structure known as The Erskine House. The name derives from one of its several owners, Wilbur J. Erskine, who purchased the house in 1911 and lived in it until 1948, when he sold it. The more correct name for the building is related to its historic use, the Russian-American Company magazin (storehouse), or simply, the magazin. The magazin is in the heart of "old" Kodiak. The building is on Center (formerly Main) Street near Marine Way, on the southwest corner of Block 16, facing southeast. It sits on a bluff which rises 30-40 feet above the channel separating Kodiak Island from Near Island. Southeast of the building is the remnant of a seawall built by the Russian-American Company to serve as a dock and a foundation for a large warehouse which was completed around 1860. A modern warehouse now rests on this seawall, but the original Russian rock work and anchor rings are visible from the water. Although modern Kodiak appears to press in on the old magazin the property always has been in the center of a bustling maritime community. A map, dating from 1808, shows a warehouse (magazin) on the site of the present-day structure, surrounded by a church, the "Governor's House," workshops, and dwellings. (Photos 5 and 5a). 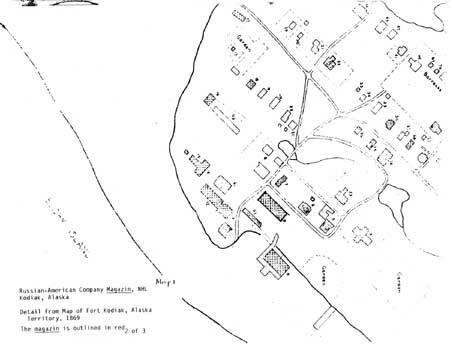 A 1965 report prepared for the National Park Service described the magazin, then a private residence, as being surrounded by a medical clinic and offices of the Alaska Fish and Game Department.1 The Russian-American Company structure today is actually more isolated on its site than at any time in the past, encircled as it is by the park. Today the City of Kodiak leases the Russian-American Company magazin to the Kodiak Historical Society. The first floor is occupied by a museum, while the second floor contains the offices of the Society. The Russian-American Company magazin is a rectangular log structure covered with horizontal wood lap siding. It has two full stories and an unfinished attic. The building measures 36 feet by 72 feet, exclusive of a one-story porch which extends across the southeast facade and is partially enclosed with glass. There is an enclosed one-story shed housing a heating plant attached to the northeast end of the building. On the southwest wall of the first floor there is a bay window. The structure has 2,152 square feet on the ground floor and 2,112 square feet on the second floor. (Photos 6-9) The gable roof is shingled and is steeply pitched, rising from the ceiling of the first floor, with an additional center front facade gable. There is a single dormer in the rear, near the northeast end. The walls of the magazin are composed of horizontal fir logs, forming a box-like structure. The logs are rough-hewn and planed flat on both the exterior and interior. The bottoms are concave and the tops convex to form a saddle fit. The logs are caulked with moss. (Photos 11-13) There are no corners exposed to view joining techniques. The interlocking of the logs is visible in the interior where wall coverings have been removed to reveal the original construction. (Photo 14 and Illustration B) The exterior walls are 8" to 11" thick, determined from the depth of the window casings. (Photos 11 and 15) They are covered by two layers of siding. The inner layer is of rough boards applied vertically and is of unknown derivation and time of placement. photograph taken in the 1940s shows streaks of what looks like paint or whitewash. The exterior layer of lap siding is redwood. (Photo 11). The earliest photographs show the structure well supplied with windows. There were six (possibly seven) on the first floor front facade, all being two light, double-hung one-over-one. Also in the front gable there were two windows, both six-over-six lights. The northeast facade is visible in an early photograph and shows one window in the attic, two on the second floor (within the end gable) and one on the first floor. (Photos 16 and 17) A second window on the first floor northeast facade is not visible in these pictures. A 1906 photograph shows a portion of the rear of the first floor and five windows (photo 18); two are out of sight. Inside the righthand door is a stairway to the second floor and a door to the right which leads to two or three smaller rooms, including a kitchen. (Photo 20) The stairwell is sheathed in horizontal tongue-and-groove boards, as is the small room to the east of the stairs. The stairwell, sheathing, and balustrade appear to be original to the structure. (Photo 21). The rear dormer is opposite the top of this stairway at the end of a short hall. There are no extant records which describe the original flooring of the building. Presently, the flooring is 3" tongue-and-groove, which is not original. 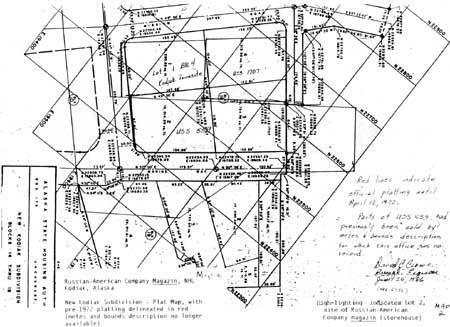 In 1963, National Park Service Landscape Architect Alfred C. Kuehl conducted a field inspection of the structure and reported, "Observation of the crawl space under the house i.e. magazin revealed hewn floor joists and beams. "5 The ceiling on the first floor is 5" tongue-and-groove decking and once supported a layer of dirt and moss which served as insulation. The floor and ceiling in the second story are not original. The dirt insulation has been removed from both floor systems. Little can be deduced about the partitioning of the second floor. All of the walls are sheathed in horizontal tongue-and-groove boards, which is a typical Russian finishing. (Photos 22 and 23) Combined with the finishing of the stairwell, this suggests that the upstairs may have been used as living quarters from an early date, and quite likely during the Russian era. The old Russian magazin has experienced some modification, but it is essentially the same Russian structure noted in a map of the 1860s and very likely dates from as early as 1808. The size and shape of the building are unchanged; its basic log construction also remains unchanged. The present arrangement of rooms on the first floor is the same as in the earliest accounts. The stair well, balustrade, and interior wall finishings of the stairwell and second floor are probably original. 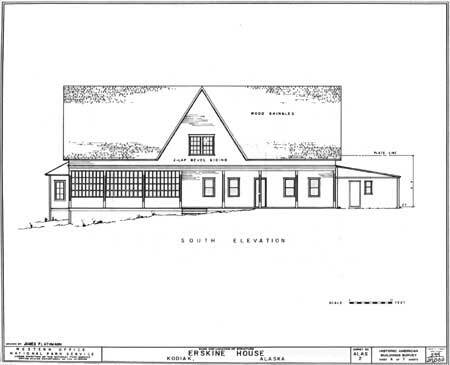 The major modifications of the structure are: possible changes in the roof line, from hipped to gable; the addition of a front gable early in the historic period; and the addition of a bay on the southwest facade. 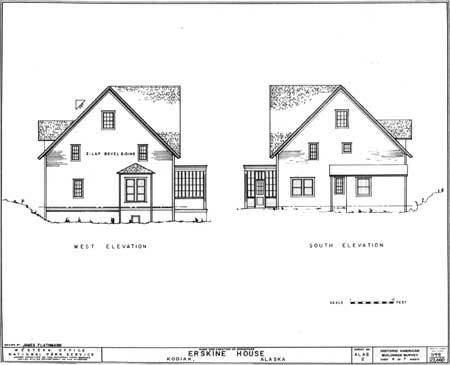 Other modifications include the replacement of the original log foundation, first with graywacke or slate beach slabs and then concrete (although the original floor joists are intact); relocation of one of two front doors; the addition of two layers of siding on the exterior; the partitioning of the second floor; the addition of a stairway to the attic; removal of the stove from the first floor and the brick chimneys altogether; and the glassing in of the front porch. The first-floor ceiling is original, but the dirt insulation has been removed; both the ceiling and flooring of the second floor are not original. There has been modernization of utilities as well, including the addition of electricity, modern plumbing, and forced-air heating provided by a furnace housed in a shed on the northeast side of the building. A Halon fire suppression system has been installed. The Alaska Commercial Company, which owned the building from 1867 to 1911, made several changes in the structure. The left front door, into the southwest room, was relocated sometime before 1898, the old doorway being made into a window. The right-hand door, into the "public" end of the building, has remained unchanged. The Alaska Commercial Company also outfitted the first floor as a residence. Two doorways were cut through the log partition wall. Photographs from 1906 show vertical bead-board wainscoting in the first-floor living areas. (Photo 20) Bead-board also was used on the ceiling of the second story and arranged horizontally on the stairwell leading to the attic. This finishing material is of post-Russian vintage. From 1911 to 1948, W. J. Erskine owned the structure and put his own stamp on it. In 1940, he replaced the log foundation with graywacke or slate beach slabs.9 In 1942 the Erskines enclosed part of the porch with glass, as it is at present.10 (Photo 25) They also used the entire house as a residence for the family, including the second floor. The earliest photographs of the building come from the 1870s or 1880s, during the era when the warehouse was owned by the Alaska Commercial Company. 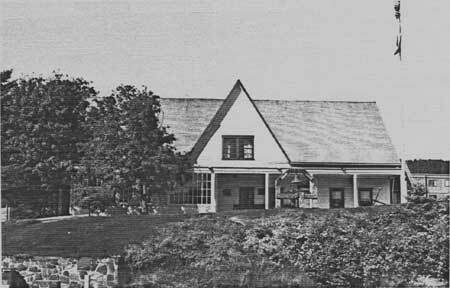 These show a structure in appearance very much like the present, that is, a two-story building with a steeply pitched roof with three gables, and a front verandah. (Photos 16, 17, and 26) It is safe to assume this was the same structure denoted in both the 1808 and the 1869 maps, at least in its basic configuration. The magazin was originally built as a warehouse for furs and as such is more crudely constructed than other structures from the Russian era in Alaska, such as the Russian Bishop's House or Building 29, both at Sitka. The logs are not carefully matched, the hewing is rough, and squaring is casual to provide a reasonably flush surface. 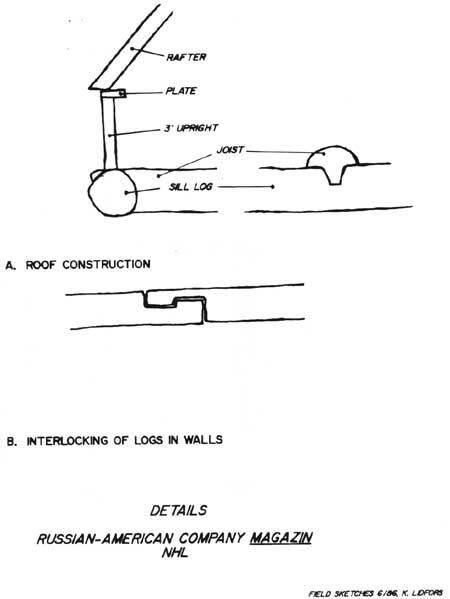 Longitudinal joinings, where logs are joined to achieve the necessary length for a wall, are very crude, but stable and secure. Moss and earth insulation and evidences of previous canvas wall covering (witness the nails mentioned above), are typical of Russian construction, as is the lack of an interior passage between the two main rooms on the first floor. The roughness of construction is appropriate for the early date and function of the building. 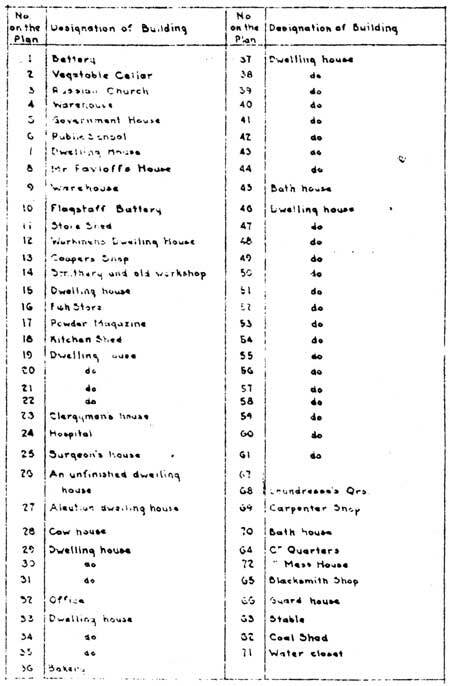 Refinements such as the numbering system marked in the logs by the hewers who worked on Building 29, Sitka, did not occur until Russian-American Company Governor Etolin imported Finnish carpenters into Alaska in the early 1840s. With the exception of the enclosed porch, the bay in the southwest facade, and the heating-plant enclosure on the northeast wall, the exterior configuration of the building is as it was in the earliest photographic evidence, ca. 1880. The interior has been modified extensively, but the first floor has been returned to what appears to be its Russian-period plan. The basic frame of the building retains much integrity, including the main interior walls on the first floor. The historic fenestration pattern and many of the original windows are still intact. The stairwell and balustrade from the first to the second floor remain unchanged from the historic period. Unfortunate losses are the original chimneys and all of the original wall coverings and insulation. 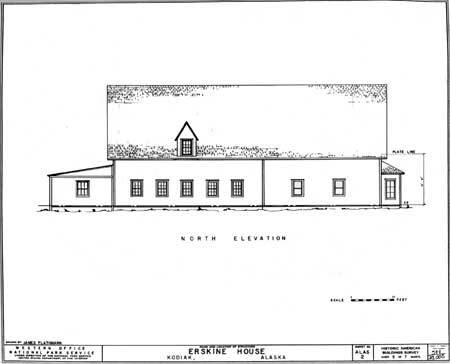 1John A. Hussey, Robert S. Luntey, and Ronald N. Mortimer, "Feasibility Report, ERSKINE HOUSE, Kodiak, Alaska (San Francisco: U. S. Department of Interior, National Park Service, Western Regional Office, 1965). 3Anne D. Shinkwin and Elizabeth F. Andrews, "Archeological Excavations at the Erskine House, Kodiak, Alaska1978," (unpublished manuscript, University of Alaska, Fairbanks, Alaska, May, 1979), p. 2. 4Letter, Wilbur J. Erskine to E. L,. Keithahn, October 8, 1948, Erskine Collection, Kodiak Historical Society. A Copy is in the NPS (ARO), Anchorage. 5Hussey, et al, "Feasibility Report," p. 10. 7Lady Franklin Visits Sitka, Alaska, 1870: The Journal of Sophia Cracroft, Sir John Franklin's Niece, ed. by R. N. DeArmond (Anchorage: Alaska Historical Society, 1981), figures 7 and 10, p. 15. 8Erskine to Keithahn, October 8, 1948. 10Letter, Nellie Erskine to Bill Roberts, August 1, 1942, Erskine Collection, Kodiak Historical Society. Copy is in NPS (ARO), Anchorage. 11Hussey, et al, "Feasibility Report," p. 25. 12Letter John C. McKenzie to Marian Johnson , Kodiak Historical Society, Kodiak, Alaska. Copy is in NPS (ARO), Anchorage. 13Letter, Lee H. Nelson, Restoration Architect to William S. Hanable, Historian, State of Alaska, November 23, 1971, Kodiak Historical Society, Kodiak, Alaska. Copy is in NPS (ARO), Anchorage. Kodiak with former Russian America Co. Magazin at center, courtesy Kodiak Historical Society. Period: 1800-1899, 1900-; Areas of Significance: Exploration/Settlement, Theme XXI, Alaska History, 1741-19?? A warehouse, or magazin, in Kodiak, Alaska, dating from 1805-1808, is the oldest of only four Russian structures standing in the United States. Although this alone distinguishes the building, its association with Kodiak, the first administrative center of the Russian empire in North America, the Russian-American Company, and the Alaska Commercial Company provides an additional dimension to the building's historic importance. From 1793 until 1808, the community of Pavlovsk, today's Kodiak, was the headquarters of the Russian-American Company and the main receiving point for furs from as far away as the Pribilof Islands in the north and Yakutat in the east. During this period, the Russians built a storehouse or magazin at Kodiak to house their wealth of furs before transit to Russia and the Orient. This log structure still stands on the original site. The old magazin is also noteworthy as the only edifice in North America which links the Russian and American trading companies which, for more than 100 years, shaped the scope and direction of settlement and exploration in Alaska, and controlled not only commerce, but government, law, and social relations on this most western frontier. Owned by both the Russian-American Company and the San Francisco-based Alaska Commercial Company, the two story log building played a part in the development of an intercontinental trading empire. At various times its sphere of influence embraced Russia, China, Japan, and the trading marts of London, as well as of San Francisco and New York. On June 13, 1962, the Secretary of the Interior found the magazin, locally known as the Erskine House, to nave exceptional significance in expressing the history of the United States and declared it eligible for registered National Historic Landmark status. Kodiak Island, midway between the Aleutian Islands and the Alexander Archipelago, was the site of the first permanent settlement established by the Russian promyshlenniki (fur-traders) in North America. 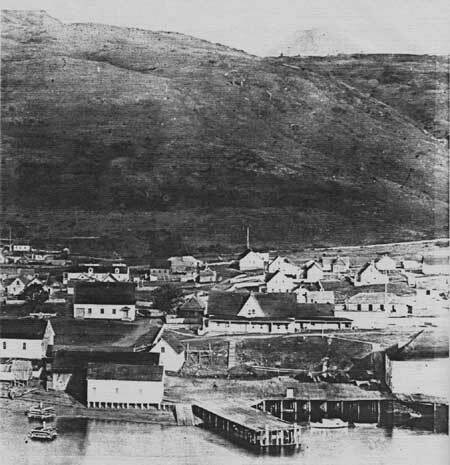 In August 1784, years after Bering's discovery of Alaska, Grigorii Shelikhov, head of a Russian trading company, established a base at Three Saints Bay (now Old Harbor) on the southeastern shore of Kodiak Island. This community on Sitkalidak Strait was named for one of Shelikhov's ships. During the next decade Three Saints became his company's principal base in America. In 1793, however, Three Saints Bay was replaced as headquarters by another community, some 56 miles northwest on Chiniak Bay. The settlement at Three Saints had been badly damaged by earthquakes, and at high tide the whole settlement was threatened by floods. Alexander Baranov, chief manager of the Shelikhov-Golikov Company, arrived on Kodiak Island in July 1791 and quickly acted to build a new site for the company's headquarters. By 1793, Pavlovsk, today the modern city of Kodiak, was ready to receive the transfer of the headquarters from Three Saints.1 For the next decade and a half, Kodiak (or Kad'iak in Russian) was the nerve center for the Shelikhov-Golikov operations. In 1799, this company was given exclusive rights to the American trade by Russian Emperor Paul I and was reconstituted as the Russian-American Company. Kodiak, as headquarters of the Shelikhov-Golikov and later the Russian-American companies, exercised all the functions of a major Russian town. It was at Kodiak that the first Russian Orthodox missionaries established the colony's first permanent religious mission, using the settlement as a base for evangelizing among the Aleutian islands and along the Alaska peninsula. At Kodiak one of the missionaries, the monk Herman (now canonized by the Orthodox as Saint Herman) established the first school for native children Kodiak also and one of the two hospitals in Russian America. From Kodiak, huge flotillas of baidarkas went out on hunting expeditions as far east as Yakutat, returning to Kodiak with thousands of pelts, which were placed in storage ready for shipment to Russia and the markets of the Orient. Plans for development of other regional centers were made at Kodiak, and during 1799-1808, the Russian-American Company established counters, or outposts, at Atka, Unalaska, Novorossii (New Russia) near Yakutat, at Lake Iliamna and Nikolaevskii Redoubt (modern Kenai), both of the latter being taken over from their failed rivals, the Lebedev-Lastochkin Company. One of the most important administrative acts, decisive for the fate of Kodiak, was to establish a major post at Sitka. Baranov's first efforts to occupy Sitka Island (as it was then known) were repulsed in 1802 by Tlingit warriors, but by 1804, the Russian flag flew over a new fort at Novo Arkhangel'sk (Sitka). In 1808, wishing to use this new post as a base for hunting otter and seals along Alaska's southern coast and also to launch colonization in northern California, Baranov transferred the headquarters of the Russian-American Company from Kodiak to Novo Arkhangel'sk. 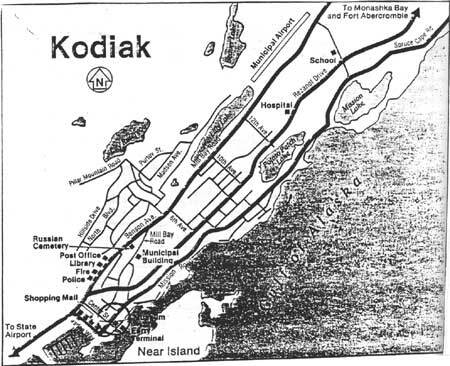 At the time of the transfer of the Russian-American Company headquarters to Sitka, Kodiak was a sizable community with some 50 log dwellings, many of which were of two or three stories.3 A map of Kodiak made by I. F. Vasil'ev in 1808 shows more than 25 structures, including one designated "newly built store," which is one of the larger buildings. (Photos 5 and 5a) A sketch of the community made by Captain Iurii I. Lisianskii of the sloop "Neva" during its stay at Pavlovsk (Kodiak) Harbor in 1804 shows no such building. Thus, it would seem that the new storehouse was built between 1804 and 1808, probably soon after Lisianskii's visit, but before the decision to move the headquarters to Sitka. Aside from its importance as an administrative and supply center, Kodiak also continued to play a crucial role for the Russian-American Company in the marketing of "soft gold." Between 1842 and 1860, it shipped 5,809 sea otter, 85,000 beaver, 9,558 river otter, and 28,000 fox pelts. Sizable quantities of bear, lynx, sable, muskrat, mink, and wolverine skins also were distributed from the Kodiak counter. Only Unalaska could match Kodiak in number of otter and fox pelts, but it had nowhere so varied a selection of animals.7 Storage for this wealth was, of course, crucial to the success of the Kodiak counter. The large storehouse built in 1805-08 was kept full, yet was not large enough for this volume of merchandise, and another warehouse was built on a new dock just down the hill from it. The move did not take place, however, because of a change in the relations between the Russian-American Company and the Hudson Bay Company, the latter's sphere impinging on the area east and south of Sitka. By 1867, when authority in Alaska was transferred from the Russian to the American government, Kodiak had a population of about 400. A military map drawn about 1869 shows 91 buildings, large and small. Several of the structures, such as the church, the new wharf warehouse, and two storehousesone of them today's Erskine Housewere substantial, multi-story buildings. (Map 1) All of these were of Russian construction. If one must focus on the Russian-American Company in order to understand the early history of America's most northwestern frontier, then it is no less vital to turn one's attention to the Alaska Commercial Company to examine the next phase of this history. The A.C.C., as it was widely known, was in every way as important as the Russian-American Company in affecting law, social order, education, religion, and commerce in the north. Until 188 Alaska had no civil government at all and did not possess even a district court until after 1900. Only in 1912 was Alaska given the benefits of territorial status within the United States. Until that date, remote communities were almost entirely without the protection of law, education was overseen by church missions, and the trading companies had almost unlimited power to affect the daily lives of nearly the whole populations especially those persons living beyond a day's reach of the capitals of Sitka, and after 1900, Juneau. Thus the A.C.C. must be seen as a major institution of the American west, and a significant influence on American economic and social history. The valuable assets of the Russian-American Company were acquired by an eastern U. S. businessman, Hayward M. Hutchinson on October 11, 1867, just one week before the ceremony which ceded Alaska to the United States. Hutchinson soon transferred the Russian-American Company assets to a San Francisco firm, Hutchinson, Kohl & Company. In September 1868, the partners in this enterprise joined with other individuals to create a new firm, the Alaska Commercial Company, which was incorporated on October 10, 1868.11 Included in the properties which were transferred to the Alaska Commercial Company were most of the Russian-American Company buildings at Kodiak, as well as at other communities in Alaska. Two years after its founding, the Alaska Commercial Company entered an arrangement with the U. S. Government which was of immense financial advantage to both parties. The Government gave the A.C.C. exclusive rights to harvest the fur-bearing seals off the Pribilof Islands in the Bering Sea.13 The Company could take up to 100,000 seals per year and was to pay the government a tax of $2.62 on each pelt. In exchange for this generous lease, the Company was to maintain schools on the Pribilof Islands of St. George and St. Paul, and to provide for their native Aleuts, both in wages and in health care. The benefit to the U. S. Government was substantial. Within 40 years from the Purchase of Alaska, the U. S. Treasury received from the Alaska Commercial Company more than $9,473,996, or $2,200,000 more than the purchase price of Alaska. According to an informal history of the Company. All of the company's seal skins from Alaska Seal Islands [the Pribilofs] were shipped to San Francisco, the skins discharged on the dock from the steamers, and counted out under supervision of Treasury officials. They were packed on the dock, with a liberal allowance of salt, in especially built barrels or casks, and then shipped by railroad to New York, then to London. Clearly, the activities of the Alaska Commercial Company affected not only Alaska, but the United States and the world economy. The discovery of gold on the Klondike River in 1896 introduced a whole new range of activity to the Alaska Commercial Company. The Company had 16 barges which it put into service shipping freight north from San Francisco and up the Yukon to Dawson, Yukon Territory. Its fleet of 14 river and five ocean steamers provided transportation for the hordes of miners trying to reach Eldorado. New communities were started to service this flood of humanity, and every village on the A.C.C. routes was profoundly affected, no only financially, but socially as well. Transportation was only one of the Company's many responses to the new economic opportunities of the Gold Rush. A.C.C. also served as the first bank in Dawson, as it had the only safe deposit vault in that boom town. The Company built the first sawmill in the Klondike country, providing lumber for the sluice boxes and homes for the miners. Outfitting the miners and provisioning the new gold-struck communities enlarged the Company's activities to nearly every hamlet in Alaska. Ultimately, the Company maintained 86 stores in Alaska and the Yukon Territory and five in Siberia. Despite complaints against the Company, the Orthodox, as well as other churches and the U. S. Government found themselves also grateful to the management of the A.C.C. for its assistance in building both schools and churches. The Alaska Commercial Company was not alone in attempting to make maximum profit from the Gold Rush. The fierce competition between several companies brought many of them to the brink of financial disaster, the Alaska Commercial Company included. In 1901, the Company merged with several of its rivals to form two subsidiary corporationsthe Northern Commercial Company, which assumed most of the mercantile and trading activities of the founding firms; and the Northern Navigation Company, which took over the transportation function. The account books of the A.C.C. show that it continued to operate an active trading station at Kodiak until 1911. About the middle of 1911, the Company sold its Kodiak District properties to "an old and trusted employe, Wilbur J. Erskine. "19 The Company discontinued paying its Kodiak agent in that year, and Erskine, operating under the firm name of Erskine and Fletcher, went into debt to A.C.C. both for the fixed assets and the merchandise. Although the Company foreclosed on Erskine in 1932, it seems that he must have made good his debt, for in 1948, he referred to one of the buildings as "my residence,"20 and his heirs subsequently sold both the residence and other properties to the mercantile firm of Donnelly and Acheson. The Erskine residence was in the old Russian-American Company magazin. Built by the Russians by 1808, the solid log, two-story structure had served Wilbur Erskine, the Alaska Commercial Company, and the Russian-American Company, as residence, store, and warehouse. Although of relatively crude construction, the Russian magazin was nonetheless the safeguard for the tremendous wealth of the Russian-American Company. It was built to last. And it has survived as one of only four Russian structures remaining in the United States. It is also essentially the same box-like structure erected by the Baranof administration, its walls and basic floor plan still intact. Among the surviving Russian era buildings, the Kodiak magazin has an additional distinction. It is the only structure which embraces the activities of both the Russian-American and Alaska Commercial companies, enterprises which shaped the face of northwestern America. Engaged not only in commerce, but in administration, law enforcement, and exploration, these companies were truly the masters of Alaska from whence they ruled the fur markets of the world. 1Svetlana Federova, The Russian Population in Alaska and California, Late 18th Century1867, trans. and ed. by Richard A. Pierce and Alton S. Donnelly, Materials for the Study of Alaska History, No. 4 (Kingston, Ontario: Limestone Press, 1975), pp. 114-115, 121. 2P. A. Tikhmenev, A History of the Russian-American Company, ed. and trans. by Richard A. Pierce and Alton S. Donnelly (Seattle: University of Washington Press, 1978). 3Archibald Campbell, A Voyage Round the World from 1806 to 1812., (Edinburgh, 1816) pp. 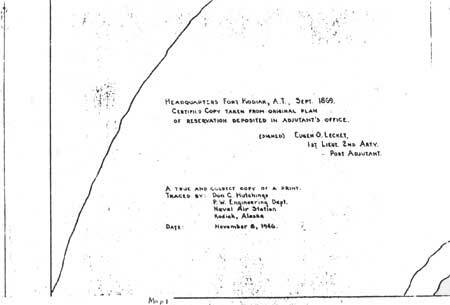 107-108, cited in John A. Hussey, Robert S. Luntey, and Ronald N. Mortimore, "Feasibility Report, ERSKINE HOUSE, Kodiak Alaska" (San Francisco: U.S. Department of the Interior, National Park Service, Western Regional Office, 1965), p. 16. 4Ferdinand Petrovich Wrangell, Russian America: Statistical and Ethnograhic Information, trans. by Mary Sadouski and ed. by Richard A. Pierce, Materials for the Study of Alaska History, No. 15 (Kingston, Ontario: Limestone Press, 1980), p. 3. 5James R. Gibson, Imperial Russia in Frontier America (New York: Oxford University Press, 1976), p. 18. 6Hussey, et al, "Feasibility Report...", p. 18. 7Captain Pavel N. Golovin, The End of Russian America: Captain P. N. Golovin's Last Report, 1862, trans. and ed. by Basil Dmytryshyn and E. A. P. Crownhart-Vaughan, North Pacific Studies Series, No. 4 (Portland: Oregon Historical Society, 1979), appendix 7, pp. 162-165. 8Ibid., appendix 10, p. 207. 9V. M. Golovnin, Around the World on the "Kamchatka," 1817-1819, trans. with introduction by Ella Lury Wiswell (Honolulu: University Press of Hawaii, 1979), Appendix 5, p. 306fn. 10Federova, The Russian Population of Alaska, p. 219. 11Hussey, et al., "Feasibility Report," p. 19. 13Samuel P. Johnston, Alaska Commercial Company, 1868-1940 (n.p. n.d.), p. 9. 15"News from Alaska," Pravoslavnyi amerikanskii vesthik [Russian Orthodox American Messenger], I, 11 (February 1-13, 1897), p. 206. 16Bishop Nicholas, Diocese of Alaska and the Aleutian Islands, "To His Excellency, William McKinley, President of the United States," Amerikanskii pravoslavnyi vesthik [Russian Orthodox American Messenger], III, 1 (January 1-13, 1899), p. 7. 17Hussey, et al., "Feasibility Report," p. 20. 19Johnston, The Alaska Commercial Company, p. 65. 20Letter, Wilbur J. Erskine to E. L. Keithahn, October 8, 1948, Erskine Collection, Alaska and Polar Regions Department, Rasmuson Library, University of Alaska, Fairbanks, Alaska. A copy is at the Kodiak Historical Society, Kodiak, Alaska. Nicholas, Bishop of Alaska and the Aleutian Islands. "To His Excellency, William McKinley, President of the United States." Amerikanskii pravoslavnyi vestnik [Russian Orthodox American Messenger], III, 1 (January 1-13, 1899), 6-9. "News from Alaska." Pravoslavnyi Amerikanskii vestnik [Russian Orthodox American Messenger], I, 11 (February 1-13, 1897), 205-207. Federova, Svetlana G. The Russian Population in Alaska and California, Late 18th Century-1867. Trans. and ed. by Richard A. Pierce and Alton S. Donnelly. Materials for the Study of Alaska History, No. 4. Kingston, Ontario: Limestone Press, 1975. Gibson, James R. Imperial Russia in Frontier America. New York: Oxford University Press, 1976. Golovin, Captain Pavel N. The End of Russian America: Captain P. N. Golovin's Last Report, 1862. Trans. and ed. by Basil Dmytryshyn and E. A. P. Crownhart-Vaughan. North Pacific Studies Series, No. 4. Portland: Oregon Historical Society, 1979. Johnston, Samuel P. Alaska Commercial Company, 1868-1940. N.P. N.D.
Tikhmenev, P. A. A History of the Russian-American Company. Ed. and trans. by Richard A. Pierce and Alton S. Donnelly. Seattle: University of Washington Press, 1978. Wrangell, Ferdinand Petrovich. Russian America: Statistical and Ethnographic Information. Trans. by Mary Sadouski, ed. by Richard A. Pierce. Materials for the Study of Alaska History, No. 15. Kingston, Ontario: Limestone Press, 1980. Alaska Commercial Company Collection. Graduate School of Business Library, Stanford University. Palo Alto, California. Erskine Collection. Alaska and Polar Regions Department, Rasmuson Library. University of Alaska, Fairbanks, Alaska. Hussey, John A.; Luntey, Robert S.; and Mortimore, Ronald N. "Feasibility Report, ERSKINE HOUSE, Kodiak, Alaska." San Francisco: U. S. Department of the Interior, National Park Service, Western Regional Office. 1965. 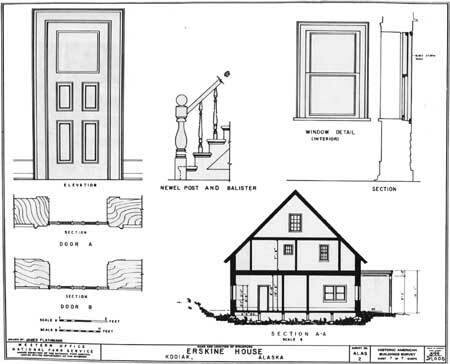 Shinkwin, Anne D. and Andrews, Elizabeth F. "Archeological Excavations at the Erskine House, Kodiak, Alaska1978." Fairbanks: University of Alaska, May 1979. Copy at Kodiak Historical Society, Kodiak, Alaska. Russian-American Company Magazin NHL, Kodiak, Alaska. 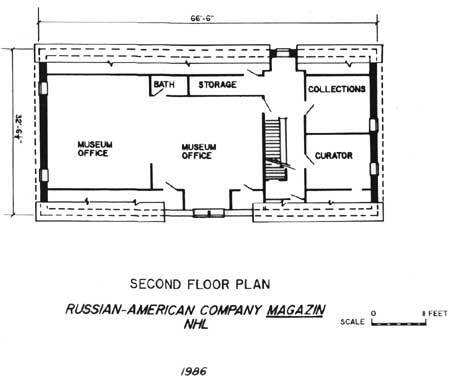 First Floor Plan, Russian-American Company Magzin NHL, 1917-42. 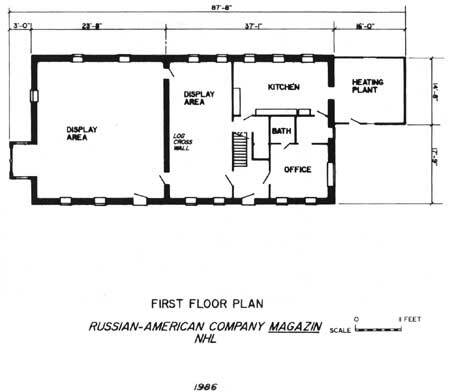 First Floor Plan, Russian-American Company Magzin NHL, 1986. 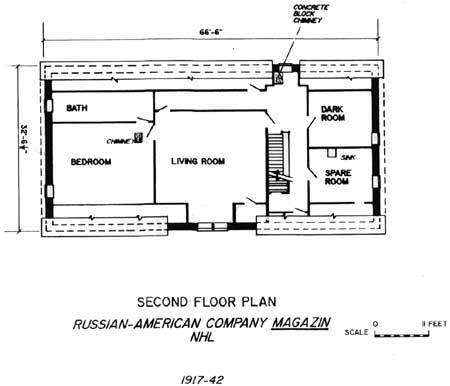 Second Floor Plan, Russian-American Company Magzin NHL, 1986. 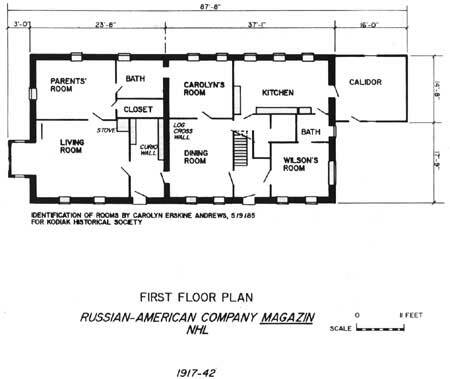 Second Floor Plan, Russian-American Company Magzin NHL, 1917-42.